The Committee on Steel Structures was established in 1971 by dividing the functions of the Committee on Bridge Structures into two with the Committee on Structural Engineering to contribute to the academic and technical development of steel structures in the civil engineering field. Since then, many activities have been carried out such as research and studies into steel materials and steel structures, holding lecture meetings and symposia, and planning and editing publications. As of November 2015, there are 16 sub-committees actively engaged in research and studies. Those research and studies sub-committees actively publicize their results by publishing the reports on their activities in the Steel Structures Series, etc. 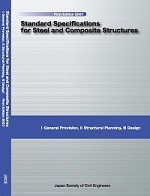 Also, the standing sub-committee responsible for the Standard Specifications for Steel and Composite Structures has adopted and published the Standard Specifications for Steel and Composite Structures (General Provision, Structural Planning, Design: 2007, Seismic Design: 2008, Construction: 2009, Maintenance: 2013). In 2010 an English language edition of the “General Provision, Structural Planning, and Design” was published, with the aim of establishing internationally competitive standards compatible with the performance-based design method. Each volume is currently being amended, with the “General Provision, Structural Planning, and Design” volume scheduled for publication in 2016, and the Seismic Design volume scheduled for 2017. Also, in 2007 an “Overseas Exchange Sub-committee” was established with the objective of communicating information on Japanese steel structures internationally. This sub-committee actively promotes introduction of Japanese steel structure technology and the Standard Specifications for Steel and Composite Structures to overseas countries, collects information on steel structure technology in overseas countries, and engages in technical exchange with various countries. 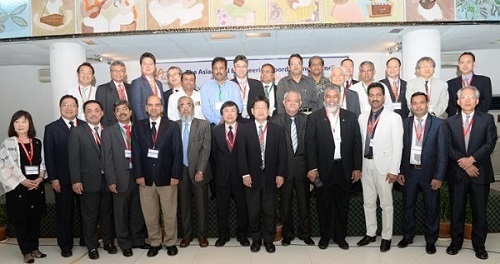 Exchange symposia have been held to date in Australia (2009), Thailand (2009), Bangladesh (2010, 2015), Cambodia (2010, 2011), and Vietnam (2012). As part of the information dissemination activities, electronic archives of publications edited by the Committee on Steel Structures or its research and studies sub-committees, collections of conference proceedings, etc., have been prepared and can be downloaded as electronic files from the committee website, so that the results of the committee’s activities are widely publicized. In addition, the Committee on Steel Structures holds a “Symposium on Steel Structures and Bridges” once a year, a basic course on steel structures twice a year, a steel structure technology succession lecture meeting once a year, and actively undertakes to improve the skills of the members in steel structures by returning the results of the committee’s activities to the members and implementing continuing education. Important themes have been set such as disaster prevention and disaster mitigation technologies for steel and composite structures in preparation for natural disasters, technologies for life extension of existing structures, and technologies for repair and rehabilitation, so the activities of the Committee will continue in order to realize safe and reliable steel structures. Furthermore, we are considering deepening exchange with academic organizations and industries associations in East Asia and Oceania, and the development of activities to produce an East Asian code for steel and composite structures. American Society of Civil Engineers　(ASCE) 2015　Convention was held at New York Marriott Marquis at Times Square, New York, on October 11-14, 2015. 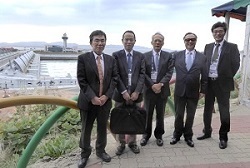 JSCE sent a delegation headed by Noriaki Hirose, the president of the JSCE. In the Opening Plenary Session on the second day, Luke Williams, international best-selling author, gave a keynote speech entitled "Disrupt: Think the Unthinkable to Spark Transformation in Your Business.” His “disruptive thinking” concepts and presentation with razor-sharp wits strongly impressed the audience. 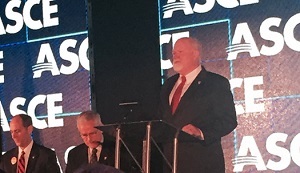 At the beginning of the installation ceremony, 2015 ASCE President Bob Stevens gave a farewell address. He spoke his duties and travels around the world as president. He then introduced Mark Woodson as the 2016 ASCE President and Norma Jean Mattei as the President-elect. Mark Woodson has been the CEO of a construction consultant company in Arizona as well as an engineer with extensive experience in advising various state projects in Arizona. During the ceremony, his four children gave their blessings in a message. In addition, the "Dream Big Film, which was sponsored by Bechtel Corp. was played. The Dream Big Movie Project” is a giant-screen 3D film and a large-scale outreach program designed to promote understanding and interest in engineering, science, and technology among young engineers and open up new engineering opportunities, especially for children in grades K-12. The convention offered many concurrent sessions. I attended “ASCE 2013 Report Card: Have We Raised Our Infrastructure Grades?” and “Diversity & Inclusion in Civil Engineering: Opportunities, Innovation & Best Practices.” The latter session had presentations and discussions on how leading civil engineering employers were leveraging diverse workforces and community engagement initiatives to implement ground-breaking innovations in civil engineering technology. An ASCE-JSCE Meeting was held on October 12. The participants from the ASCE including Robert Stevens, 2015 President, and Mark Woodson 2016 President, Thomas Smith, Executive Director, Meggan Brown, Director of International Relations, and Carol Bowers, Director of Communications. JSCE president Noriaki Hirose provided an overview of the flooding disaster that occurred in Kanto and Tohoku last September. His speech was followed by a presentation of information about CECAR7, scheduled to be held in Hawaii next year, and CECAR8, scheduled in Japan in 2019. The JSCE asked the ASCE to participate in a new ACECC Technical Committee on disaster prevention and mitigation, and they agreed to participate in it by sending their experts. The ASCE offered the JSCE advice regarding publication methods, the “infrastructure health check" and other matters related to the ASCE’s Report Card. In addition, the JSCE’s efforts to reduce the adverse impact of climate change were explained with the draft of English version of "Adaptation and mitigation measures for climate change. 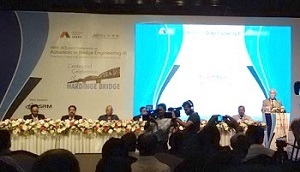 Signing AOC between the ASCE and its international counterparts was the major item of luncheon meeting on October 13. The renewal of AOC between the ASCE and JSCE was signed by the following attendees: ASCE 2016 President Woodson and Executive Director Smith for the ASCE, and President Hirose and Executive Director Tsukada for the JSCE. This year again Japan Society of Civil Engineers (JSCE) was invited by the Korean Society of Civil Engineers (KSCE) to attend their annual convention KSCE 2015 Convention. 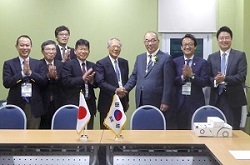 Four persons from JSCE attended the convention which was held in Gunsan, Jeonbuk, Korea: President Hirose, Professor Hajime Mase of Kyoto University, Biehn Baik, Ph.D, PM (Chodai Co., Ltd.), Korean Group Member of the International Exchange & Cooperation Group, International Activities Center, and Katsuhama. Using the opportunity of this year’s annual convention, an executive committee meeting (ECM) of the Asian Civil Engineering Coordinating Council (ACECC) was also held at the venue. Other participants were also sent from JSCE to attend the ACECC ECM. The occasion of this visit to Korea was also used as an opportunity for exchange with the JSCE Korea Section. 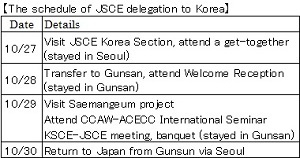 The JSCE delegation’s schedule is shown in the table. The JSCE Korea Section has an office in the Gangnam District of Seoul, which is the base for exchange among the Section members. Also exchange is carried out using the SNS app BAND. Kim Jae Kwon, President of JSCE Korea Section, arranged the visit to the Saemangeum project, including the world’s largest scale storm surge barrier at 33 -km long. At the CCAW-ACECC International Seminar, there was a discussion regarding measures for adapting to climate change in the water resources field, and a presentation from JSCE entitled “Analysis of seawall stability and adaptation method for climate change” was given by Professor Mase. At the KSCE-JSCE meeting, opinions were exchanged regarding the new Technical Committee (TC) on disaster reduction and prevention proposed by JSCE and whose establishment was agreed at the ACECC ECM, cooperation regarding the Civil Engineering Conference in the Asia Region (CECAR), vitalization of exchange between branches, and mutual use of special privileges for members of JSCE and KSCE, etc. 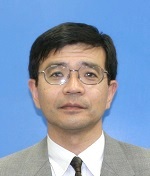 At the banquet, President Hirose gave an address in which he thanked the host for their invitation, expressed his expectations for further development of exchange between JSCE and KSCE, which has been continuing for many years, and called on the participants from each country to cooperate with the new TC of ACECC. The summary of feature articles in the JSCE Magazine is available on the JSCE website. The IAC News is one of the communication tools to share information and ideas with the members. We would like to invite you, your friends and colleagues to join the communication and to subscribe the IAC News. Please register online: (http://www.jsce-int.org/pub/registration/non-international_students). We look forward to meeting you.